A co-ordinated range of accessories allowing you to mix, match and co-ordinate your kitchen in a striking array of colours. 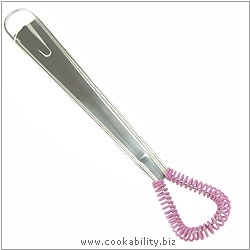 The perfect handy mini whisk. Ideal for removing lumps in custard, gravy and sauces, great for scrambled eggs, and suitable for non stick pans. Made from food grade silicone and 18/8 stainless steel. Easy to clean in hot soapy water. Heat resistant from -40°C to 220°C.